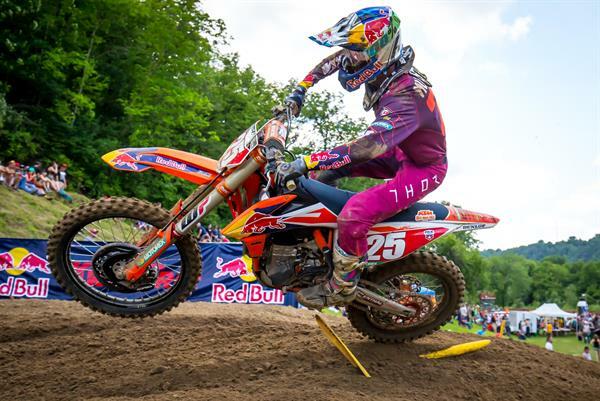 MILLVILLE, Minn. – Following a weekend off from racing, Marvin Musquin and the Red Bull KTM Factory Racing Team returned to action in Millville, Minnesota for Round 8 of the AMA Pro Motocross Championship. Leading a majority of the laps in 450MX Moto 2, Musquin put up a good fight to protect his championship points lead on Saturday where he emerged from the Spring Creek National with third overall on the day and a seven-point deficit with four rounds remaining in the championship. In Moto 1, Musquin got off to a second-place start aboard his KTM 450 SX-F FACTORY EDITION, where he engaged in an early battle for the lead. While running second, Musquin made a small mistake that dropped him back to third and he held onto that position for the next three laps. Another mistake took place for Musquin in the form of a big crash on lap six as he cross-rutted on a down-hill and went down hard. After remounting and adjusting his clutch lever, Musquin spent the remainder of the moto playing catch-up where he salvaged fourth-place in Moto 1. In Moto 2, he got a great jump off the line and put himself into the lead on the opening lap. He established a good pace out front and maintained the lead for the first 13 laps, until a hard-charging Eli Tomac interjected himself late in the race. With three laps to go, Tomac was able to make a pass for the lead that would ultimately stick, giving Musquin second-place in Moto 2 and third overall for the day. It was another solid day for Rocky Mountain ATV/MC – WPS – KTM’s Blake Baggett, who earned another top-five overall in the 450MX class with 3-4 moto finishes. Baggett sits fifth overall in the championship standings. Troy Lee Designs/Red Bull/KTM’s Alex Martin earned third overall at his home track in Minnesota with 7-2 moto scores for the day. Martin continues to hold second overall in the 250MX Championship standings with four rounds remaining in the series. His teammate, Jordon Smith, rode to a season-best third-place in Moto 1, where he went on to earn fourth overall for the day, his best overall finish of the season to-date. This entry was posted in Moto, Motocross, Motorsports, National News, Offroad by admin. Bookmark the permalink.